Co-Packing is an abbreviated term for a manufacturing process called Contract Packaging. It usually involves a manufacturer signing a non-disclosure agreement before a customer shares their product formulation. The customer will retain the rights and ownership of the proprietary formula and information provided. The Co-Packer will then produce a small test batch to the specification of the client. This will be agreed upon and a larger batch will be set up. The Co-Packer will then complete the Nutritional analysis for label development and printing. This system is often used by a manufacturer in different overseas markets. It saves on logistics and costs and solves a multitude of associated problems. To avoid confusion with Co-Packing, the main difference is that a customer will choose a manufacturer and agree on the manufacturer’s product formulation and ingredients. If required, the manufacturer can deal with literally everything, from sourcing, consulting, branding and packaging design, website design, product photography, printing, marketing and even product launch. 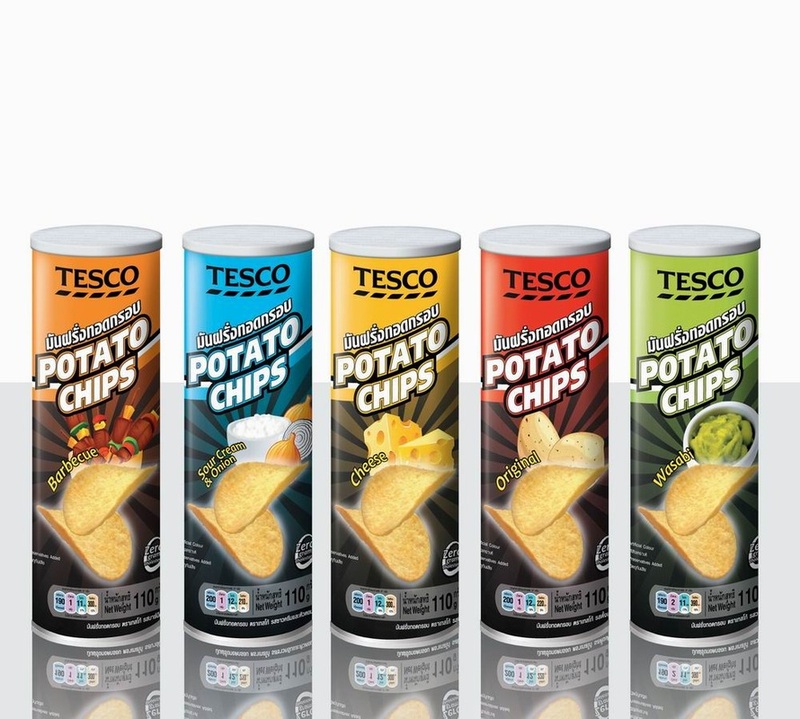 It is quite common for a major Chips and Crisps Manufacturers to cook up a small company’s products to test the market before a full Plant is purchased. There are companies that specialise in this manufacturing process, battling with each other to get contracts with supermarket chains for private label goods. Similarly, you may find mainstream manufacturers that are happy to make other company Chips and Crisps. A little research into Private Label production revealed a great deal about the cost savings available to companies, especially multi-national brands. Shantou S.E.Z. Yusheng Food Industries Co., Ltd., based in Guangdong, China, informed us that included in their customer list, among other major worldwide brands, is UK supermarket giants Tesco. Using their 'Pringles style' product as the example, they explained that included in their extensive flavors list are: Original, BBQ, Sour cream & Onion, Cheese, Salt & Vinegar, Pizza, Ketchup, Chili Chicken, Lime & Black Pepper, Thai, Curry, Wasabi, etc . This is based on the smallest quantity in the Wonderful World of Chips & Crisps, but the mark-up for retailers is very easy to extrapolate from that information alone. For the small 40g tins, a carton will contain 48 tins and they would pack up 1,050 cartons in a small container. These work out at just $0.34 per tin. These are obviously first enquiry results and there are many companies throughout Asia that provide these services. The costs for larger quantities reduce significantly. While many of these retailing giants find it practical to go to Asia to get incredibly cheap product, many medium to large sized companies will use domestic Private Label suppliers. They are also a customer of Kolak, the UK's biggest Private Label manufacturer, as you can seen from their client list. On-site Potato Chips and Crisps manufacturing companies pop up occasionally. They provide a Franchise style operation for licensees to purchase into their company. Examples include; Chippery, who are a Canadian based company and Snack Fresh from South Africa. A visit to their websites will reveal more about their services.